IT WAS late July when Ryan Howard pointedly asked a reporter whether he wanted to trade places with him. The anguish in his tone was palpable. A former perennial MVP candidate, the slugger's career was nearing its nadir. Two years removed from a return from a ruptured left Achilles' tendon, Howard was, statistically speaking, one of the least productive everyday players in baseball. He had been benched by his Hall of Fame manager and inundated with rumors about the Phillies' desire to trade him or release him. The litigation ended late last month in a U.S. District Court in Missouri, with Howard and his family reaching an undisclosed settlement out of court. Court documents filed in Howard's home state of Missouri paint a picture of a family in turmoil. Howard's brother Corey alleged that he had unjustly terminated a consulting agreement between the two, and Ryan in turn alleged that his father, Ron, mother, Cheryl, and brothers were enriching themselves at his expense. Fox 29's Howard Eskin first reported on the existence of the suit. Ryan's version of events portray his father as taking control of his finances early in his career to guard against outsiders taking advantage of the superstar's burgeoning fortune. "Ron Howard is the family patriarch," Ryan's response to his brother's lawsuit states. "When he gave orders, directions or suggestions to family members, they were not to be questioned. It was considered wrong to disagree with him." As such, Ryan accepted his father's advice to put his finances in the hands of his family. After winning the National League MVP award in 2006, Ryan incorporated a company called RJH Enterprises, into which, court documents say, he had contributed more than $8 million. Those documents paint a picture of a financial arrangement that, in Howard's first few years in the majors, operated principally on familial trust. 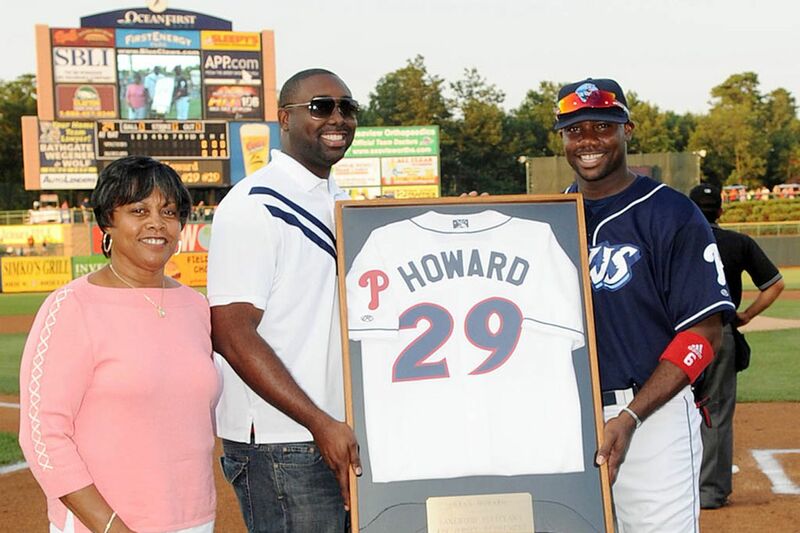 That trust was a major narrative early in Howard's career, with the personable, wide-smiled slugger attributing much of his success — and his ability to adapt to the big-business atmosphere of professional baseball — to his family. "If you talk to his parents, it will help you understand Ryan," Howard's high school coach told the Daily News in August of that year. "They're such supportive people, of their kids, of this school. It's such a good family." From all accounts, Howard and his twin brother were inseparable. During high school, they practiced trombone together after school. At Missouri State University, they roomed together. As the Phillies scattered across the country to bask in the glow of their 2008 world title, Howard spent the offseason hanging with Corey, in his words, "flying under the radar." "Growing up with him, ever since we were little, I'm just a fan like everybody else," Corey told the Daily News. "I'm proud of him. I'm happy for him." Corey Howard says he worked for his brother without a written contract for 3 years before the two put their unique arrangement in writing in the form of a 15-year "consulting agreement" that paid Corey $92 per hour, plus a 5 percent commission on any marketing/business agreement negotiated by Corey. The suit says that Howard was paying his brother $7,975 every 2 weeks. The suit details gifts Howard gave to his parents as his fortune grew, including a 2007 BMW, a 2007 Aston Martin, and a 2011 Mercedes GL550 Truck. Howard and his brother had been roommates throughout their lives, and that continued throughout the early part of Howard's career. But things began to sour around the time Howard and the Phillies wrapped up their fateful 2011 playoff run that resulted in a Game 5 loss to the Cardinals in the NLDS — the last play of which was the groundout on which Howard ruptured his Achilles'. "By late 2011," according to Ryan's countersuit, "Ryan had become concerned with whether Corey and his other family members were really working to protect his financial interests or were attempting to enrich themselves at his expense." Howard claimed that he had paid his family at least $2,795,337.38, all based on his mother's authorization. Howard claimed that he did not know of these payments until he took over financial control of RJH Enterprises in July 2012. A few months later, according to court documents, Howard watched a TV show titled "Broke" about "the financial plight of certain star athletes who had entrusted their business affairs to the family." In the court documents, Ryan Howard claimed, "Corey and the other family members provided little to this (marketing) process, other than to conceal matters from Ryan. In fact, some potential sponsors chose not to do business with Ryan and RJH because they found the family members difficult to deal with." But when, as it was phrased in Ryan's countersuit, he told his father he wanted to take control of his financial affairs and "have his family just be family," Ron Howard's response was that "if Ryan wanted him to walk away from Ryan's business affairs, Ron should receive $5 million himself and Cheryl should receive another $5 million." Howard thus filed a counterclaim against his family members, alleging that his twin brother "engaged in a conspiracy with Ron Howard, Cheryl Howard, and (brother) Chris Howard to defraud RJH." The suit centered around three "consulting agreements" that Howard alleged he signed without reading because of the intimate trust he placed in his twin brother. "Because Corey was his twin brother, college roommate, and housemate who regularly accompanied him to social and business engagements, Ryan placed trust and confidence in Corey," a subsequent filing by Ryan stated. In that same filing, Ryan alleged that his family members "refused to provide him access to the RJH books and records and the RJH contracts."